According to a 2014 report from Complete College America, a nonprofit group based in Indianapolis, just 19 percent of full-time students earn a bachelor’s degree in four years at public universities. The stats are even worse at community colleges, where five percent of full-time students earn an associates degree within two years, and just 15.9 percent earn a one- to two-year certificate on time. Some of why students are taking longer to graduate centers on the lack of clear planning, changing majors, changing universities, and taking unnecessary courses, suggests a variety of research. But Rachel Carlson, the cofounder and CEO of Denver-based Guild Education, says there are plenty of non-academic factors at play, too, including soaring tuition costs and shift work that can interfere with community college class schedules. 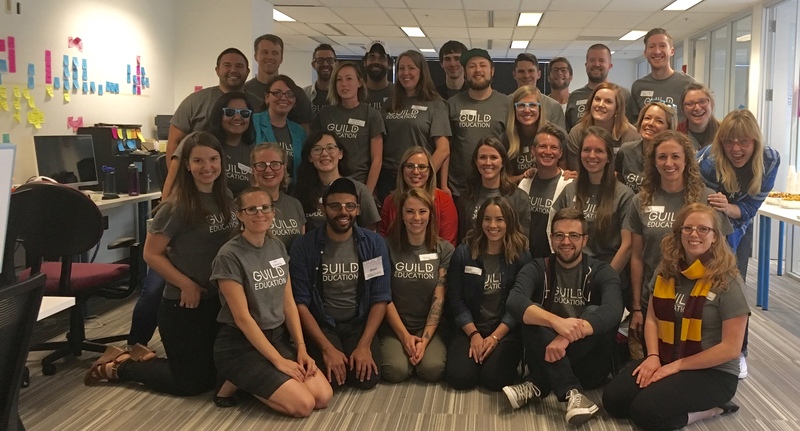 To help those many students who are working their way through college, as well as help companies that recognize the importance of helping employees realize their full potential, 16-month-old Guild partners with employers including Chipotle to offer education as a benefit, right alongside healthcare. Either way, Guild’s platform makes it a lot easier for companies to turn this education expense into an employee perk by enabling their staffers to earn college credits and pursue undergraduate and graduate degrees. And it does it in two ways. Guild has created some of its programming, which currently includes GED, ESL, and undergraduate-level management training courses. It also has ties to four online college programs, including Colorado State University’s Global Campus, Western Governors University, Bellevue University, and Brandman University (the online arm of Chapman University). A few of the undergraduate degrees that Guild offers through these university partners center on business and advanced manufacturing. It all adds up, so to speak. Chipotle claims its employees can pay as little as $250 per year to go to college. Guild has competition, including from plenty of universities that offer online courses directly, and from companies like Udacity, which is working with employers to create programming that caters to their employees specifically. Certainly, VCs seem to like what it’s preaching. “It’s no surprise that education is the fastest growing corporate benefit program in the U.S.,” says investor Scott Raney of Redpoint Ventures. He calls Guild’s proposition a “win for all parties.” Indeed, the 38-person company just raised $8.5 million in Series A funding led by Redpoint, with participation from Social Capital and its seed backers, Harrison Metal, Cowboy Ventures, and investor and Stanford lecturer Fern Mandelbaum. Pictured at page top: Cofounder and CEO Rachel Carlson, who formed the company with her former classmate, Brittany Stich. Stich is currently the company’s head of student services and academics. Like Carlson, she holds both an MBA and master’s degree in education from Stanford.